After you purchase, get started in 3 easy steps. Watch the video below. There are 2 parts to AppPresser, your WordPress website, and the My AppPresser Dashboard. The first thing you need to do is install AppPresser theme and plugins on your WordPress site. Next, you will build your app using the My AppPresser Dashboard. After you purchase AppPresser, you will automatically get a dashboard on myapppresser.com. Visit your site and login following the instructions in the email you were sent. After you login, you will see your app dashboard. This is where all of your apps will be displayed. Click the orange "New App" button and give your app a title, then click create app. Your app will be created, and then you should see your app dashboard. Here you can choose to customize your app, setup push notifications, and more. Click "Customize and Build App" to go to the app customizer. Here you can change your app colors, add pages, menus, and more. Here you can change your app colors, and even write custom CSS that will be applied to your app. The settings tab allows you to set your app menus, and enter information about your app. This tab is where you will build your app once you have finished customizing it. Press "Build App" to compile your app for testing and/or app stores. Enter your PhoneGap Build auth token to compile for a device. This will allow you to use a QR code to scan and get the app onto your device. Please note that iOS requires a signing certificate or else it won't work. The menu controls all pages that are displayed in your app. Custom link: add a custom link with the full url to your WordPress website page. This is how you display WordPress pages in your app. 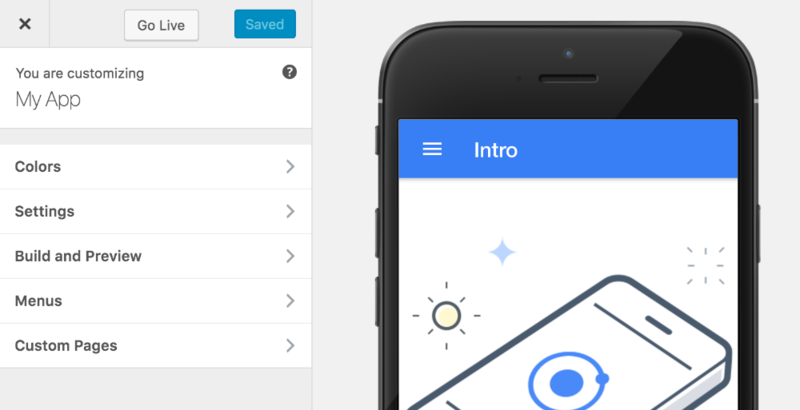 App Pages: first create a custom page, then add it to the menu to be displayed in your app. Custom pages are either static HTML that works offline, or they can be list pages that fetch data from an API. These are not specific to WordPress, and they can be any content at all. For example, you can create an About page that displays an image and text, and it will be embedded in the app so it works without an internet connection. You can also create a list page that displays WP-API driven content such as posts or pages. If you make any changes to your app, press the save button. If you do not see your changes take effect in the preview, refresh the page. Pressing "Go Live" is only necessary to push your changes to your live app. For example, let's say you have an app on the app store, and it is blue. You want to experiment changing the color to red, but you don't want current app users to see this change yet. Make your changes in the App Customizer, and preview the new color. When you are satisfied, press "Go Live" and your live app will change to red. *Note: App users must close and reopen your app before they will see the change. Push notifications require some setup, please view this documentation.